This Bulgarian descendant has made his dancing career a priority. His technical education could not compete with his love for dance and a desire to share and teach his passion for dance to students of all ages. Ivan began dancing as a youth in Bulgaria to overcome shyness. It worked! After moving to the U.S. and becoming an American citizen he gave up a technical career to become a highly rated dance instructor and studio manager in the Tampa Bay Area. During his 35 years of dance he has very successfully competed worldwide both in the pro/am and pro divisions and has performed locally. Today, Ivan is the owner of Dance Passion Studio in Saint Petersburg. 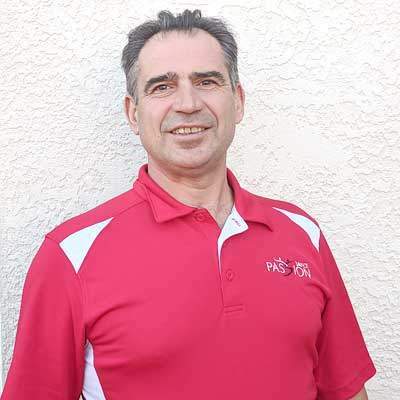 Being proud of his dance journey and accomplishments, Mr. Grigorov encourages his staff to always strive for excellence while sharing their joy and knowledge of dancing. Sarah Johnston was born in Indiana, but raised in Bradenton, Florida. Sarah graduated from the University of Florida in May of 2015 with a Bachelor of Music in Music Education and a Minor in Theatre. She discovered her passion for music and theatre at a young age, but the love of dance came much later after finding a salsa dance club in college. Sarah soon began to teach salsa to her peers, and discovered ballroom soon after. Sarah’s belief that dance can change and enrich lives is the passion that fuels her dedication to teach dance to others. Her goal in dance is to pass on as much knowledge and love for the arts as possible, and help people to gain confidence both on and off the dance floor. Carlos Mateu was born and raised in Havana, Cuba, where he began dancing Afro Cuban and Salsa on the streets of his hometown at the age of eleven. By age 13, Carlos was traveling and performing internationally with a respected Quinceanera dance troupe. “If you are Cuban,” Carlos has been known to say, “There are three things you know about yourself. You can dance, you can sing and you can play baseball.” After mistakenly walking in on a dance competition in a hotel, Carlos knew dance would be his career. Carlos began teaching ballroom dance in 2011 and moved to the Tampa Bay Area in 2014. He has worked for both Arthur Murray and Fred Astaire franchises. He is an energetic instructor that loves to spread the joy and passion that he has for dance. Carlos teaches both social dancing and competitive Dancesport. He loves seeing his students become the dancers they always dreamed of being. Realist that he is, Carlos knows dreams need help from practice, technique and the watchful eye of a supportive instructor. A Saint Petersburg, Florida local, was always known for putting on little dance performances for his friends and family. In his adult life he rediscovered this passion when, on a whim, he took a some dance classes in college. He has performed on stage a couple times with Comotion Dance Theater. He also was in a few plays with Saint Petersburg College. Dance has even saved Bryan’s life on multiple occasions when things have gotten hard. Using dance as a major stress relief and way to express himself in ways that words never could. Eventually, he found a home away from home in places that offer both line dancing and partner dancing. As an instructor, Bryan is very in-tune with what his students want and need. He makes sure each person feels valued and cared for as they embark on the new adventure of dance. His playful nature and gentle energy leave people smiling and laughing as they feel the stress melt away. He hopes to offer others a fun relaxing way to express themselves. That way everyone can find exactly what they need to get out of dance! When Ivan first founded Dance Passion he wanted to give people a place to dance that made them feel like they were at home. He wanted them to feel completely comfortable and safe as they started learning how to dance. That way if they messed up, they know that they were still safe and supported by the staff and other students. But while being comfortable he also wanted the experience to be fun. That way everyone was smiling and laughing and enjoying every minute that they were here.As many of our students will tell you, this place really has become a second home for them. They are able to escape the craziness of everyday life and really shine as their true selves here. All while learning to dance and laughing and having an amazing time. He also wanted to have a studio that felt like one big happy family. And in this family he wanted to have people of every background and from every walk of life. That way everyone could shine as exactly who they are, while still sharing the wonderful passion of dance! As you walk in the door everyone says hello and makes you feel like part of the Dance Passion Family! Your dance journey is super personalized to who you are as an individual and you learn the things that will make you feel as if you are a shining star! That way, no matter where you fit into the family, there is always a spot just for you.